Sanctuary Cities, like Boston, aim to reduce the fear of deportation and possible family break-up among people who may be in the country illegally so that they will feel safe to report crimes, make use of health and social services, and enroll their children in school. Drop City was a 1960s Utopian art movement in rural Colorado came to stay and work on the innovative construction projects, including inhabitable domes inspired by the futuristic concepts of Buckminster Fuller. BAC student leaders, inspired by the idea of a Sanctuary City, and mindful of the Drop City movement have conceived of a celebration where ALL are welcome to come as you are -- BE WHO YOU ARE – and dress up fancy or casual and comfortable as your prefer -- and dance under the warm protective glow of the Geodesic Psychedelic Dome hovering above a radically transformed Cascieri Hall. Do not miss this moment to celebrate the end of the school year with YOUR diverse and exceptional BAC community! 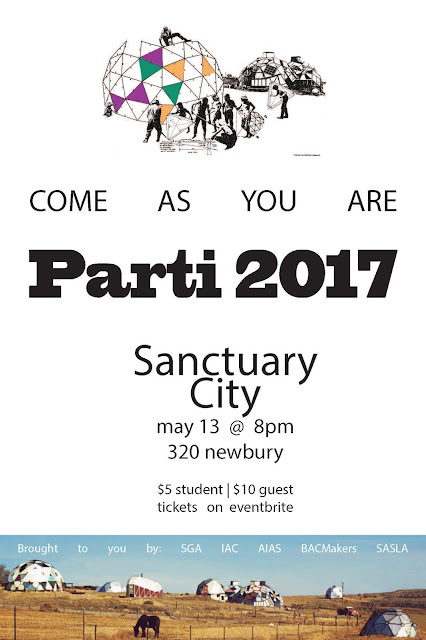 We are looking for volunteers to help set up and clean up after PARTI; please contact studentlife@the-bac.edu for more information and to sign up.